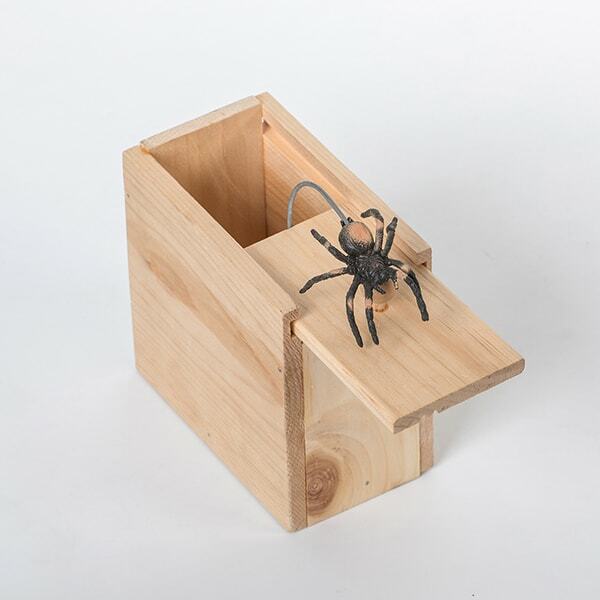 Give this wooden box to your unsuspecting family and friends and watch as they slide open the lid. Be prepared - there will be screams (and maybe a few jumps), as the toy spider pops out. We found this mystery box from Amish craftsmen and just had to test it out ourselves. The design is so simple, but the effect is priceless. We heard several shrieks, watched our co-workers jump, and even when some of us knew what was in the box, we couldn't help but move when the spider sprung out. We had so much fun that we're now passing it along to you, so you can make some laughter-filled memories with loved ones. The surprise of the spider and idea is great. The quality and craftsmanship of the actual box is very poor. The lid and walls and are crooked and do not line up. One side of the wall is cracked. Again the surprise of the spider is well excecuted, just a very sloppy assembly.